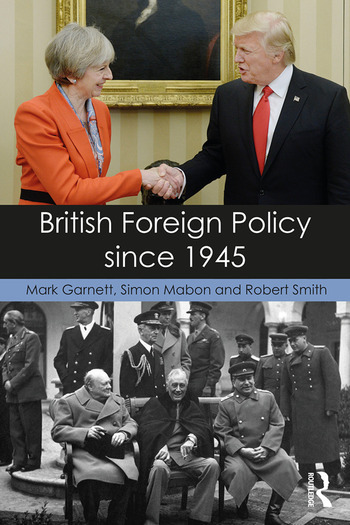 British Foreign Policy since 1945 brings a chronological approach to the study of British foreign policy since the Second World War in order to make the principal events and dynamics accessible within a broader historical and cultural context. a range of in-text features including essay questions and seminar/discussion topics. This timely book will be essential reading for anyone interested in British politics, foreign policy analysis and British history. Mark Garnett is Senior Lecturer in Politics and International Relations at Lancaster University, UK. Among many books and articles on UK Politics, he is co-author of Exploring British Politics, 4th edition (2016), and British General Elections since 1964 (2014). Simon Mabon is Lecturer in International Relations and Director of the Richardson Institute at Lancaster University, UK. He is also a Research Associate with the London-based think tank the Foreign Policy Centre, and is the author of Saudi Arabia and Iran (2013) and the co-author of The Origins of Isis (2017), among other publications. Robert Smith is a Lecturer in International Relations at Coventry University, UK. He has previously taught at Lancaster University, UK, and was a Senior Lecturer in British defence and foreign policy at the Royal Military Academy Sandhurst and worked for the British Foreign and Commonwealth Office in Iraq advising on the development of Human Rights policies in the immediate aftermath of the 2003 invasion. He has also written on the development of policies of humanitarian intervention in the post-Cold War era.